Most of us will never step onto a battlefield. We won’t know what it sounds like when artillery whines over head so close you can feel the wake ruffle your hair as it sails by. We’ll never know what it’s like peer across the confusion of a smoke enshrouded field to hunt for the enemy, only to find him at your back. 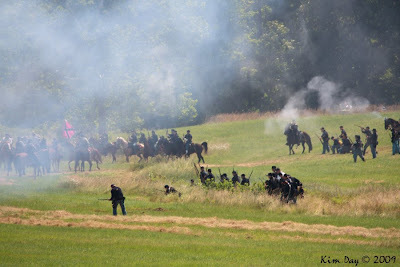 But on Independence Day, just outside Gettysburg, you could imagine what it might have been like. Hooves thundered across the field. 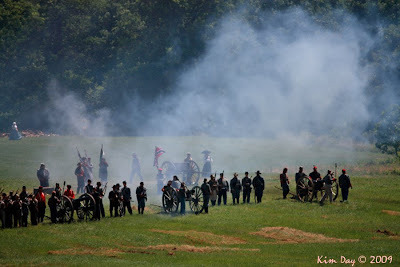 Canons roared and spewed enough smoke to dim the sunlight on one of the brightest Saturdays in more than a month. 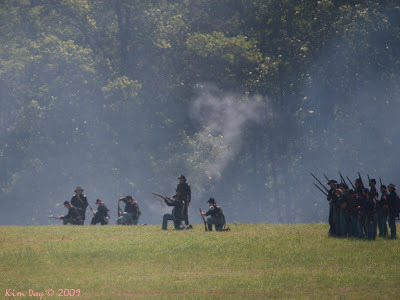 The report of a pistol echoed across a field as a soldier dropped to march no more. Sabers clanged as Blue and Grey clashed in an echo of a 146 year old fury. 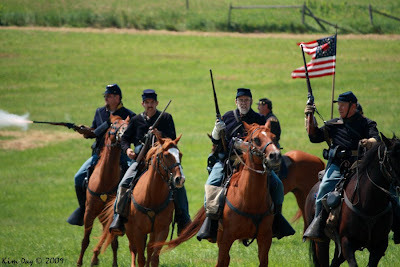 No the South hadn’t risen again, but this year’s crop of Civil War reenacters had. 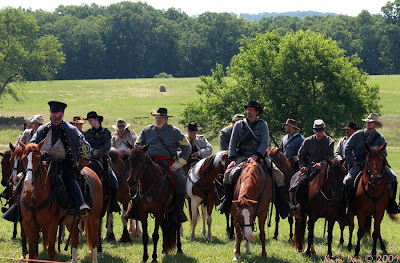 For an hour they stormed across the field–first on horseback and later on foot as they reenacted one of the key turning points in the Civil War. 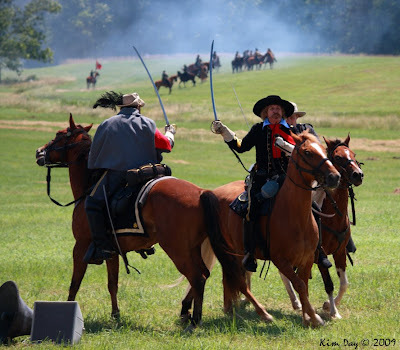 The 1st Virginia Calvary of Fitz Lee’s Brigade under General J.E.B Stuart’s command led a charge against Brigadier-General Custards 1st and 7th Michigan units in an attempt to split them. 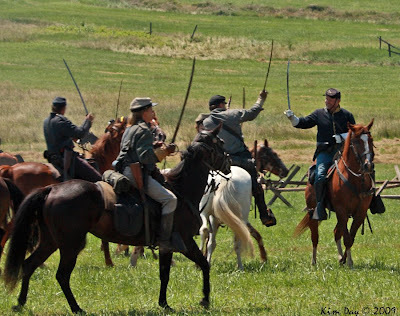 As the canons boomed, the Generals themselves clashed in whir of swords and a swirl of horses. 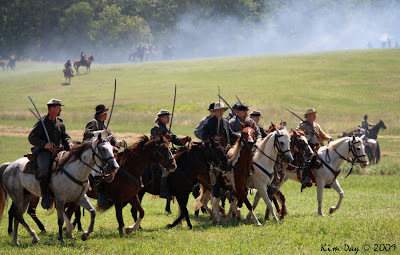 As the sounds of the final battle died away, the Union Cavalry defeated the Confederates, seizing the advantage for the first time in the war and never relinquished it again. 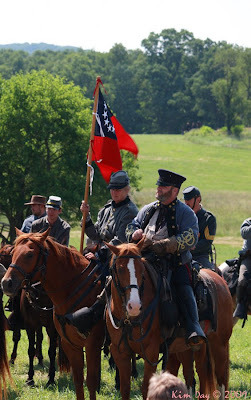 The Confederates, beaten, but not vanquished, rallied again for another battle later in the afternoon, bringing echoes of the past to life one more time. This entry was posted on Monday, July 6th, 2009 at 8:57 PM. 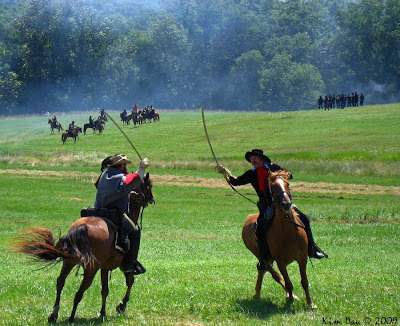 It is filed under Gettysburg and tagged with "Protecting the Union" - Virginians and Wolverines East Calvary Field, Calvary, Civil War, Confederates, Custard, Gettysburg, J.E.B Stuart, Reenactment, Union Solders. You can follow any responses to this entry through the RSS 2.0 feed.